The final race of the season is here. I cannot believe the 2018 MENCS is almost over. Next week I will begin researching my Driver Preview article to be released in January. But first we must crown a champion. The best three drivers (Kevin Harvick, Kyle Busch and Martin Truex) all made it to the final four. They will be joined by the most consistent driver this season (Joey Logano). It will be fun watching these four drivers battle it out for MENCS trophy at Homestead-Miami Speedway You can see the race at 2:30pm ET on NBC. The race is at Homestead is a normal 267 lap race on a 1.5-mile track. That means there are 66.75 bonus points available for leading laps and 133.5 points available for fastest laps. The trend at Homestead since 2015 has been for one driver to lead at least 135 laps. That driver has been Kyle Larson. Another driver tends to lead 80 laps. These drivers have been Kevin Harvick and Martin Truex Jr. the last two seasons. 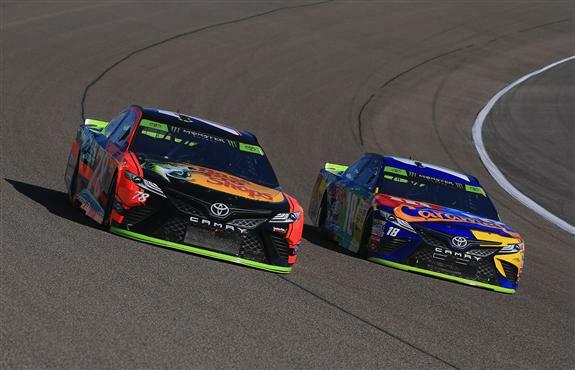 The third dominator only leads 35 laps and these drivers have been Carl Edwards and Kyle Busch since 2015. It will likely be Kyle Larson or the “Big Three” leading most of the laps Sunday so we will want them in our lineups. The drivers I expect to be the top dominators this week include: Joey Logano, Kyle Larson, Kevin Harvick, Kyle Busch and Martin Truex Jr. I will post my final DraftKings picks Saturday evening. *Pick for the Pole*: Our pick for the pole needs to be in before qualifying at 6p.m. ET Saturday. My pick for the pole will be posted after the first practice Friday (2:30p.m. ET) on the front page of this website. My two Playoff Drivers will likely be Kevin Harvick and Joey Logano. The Fords have had the most speed since mid-summer and I want two of them in my lineup. The No. 4 car has been the car to beat at the intermediate tracks. Can they avoid mistakes in the championship race? The only team that can beat the No. 4 car is the No. 4 team. If Harvick can avoid mistakes, he will be the 2018 MENCS champion. The No. 22 team had 3 weeks to prepare their car for the championship race. Team Penske choose the No. 22 car to represent the team at the tests at Richmond, Kansas and Texas. I heard that the team used part of the test session to practice for Homestead. The Fords have had a lot of speed and the No. 22 team has had more time to prepare their car than any other team in the race. That has to mean something. Logano won the pole at Kansas and finished 8th. He qualified 8th at Texas and finished 3rd. His pit crew is an all-star team made of the best performers from the No. 2, No. 12 and No. 22 teams. They turned the fastest two pit stops of the season at Texas. They will be the edge Logano needs to win Sunday. My two Non-Playoff Drivers are likely to be Kyle Larson and Chase Elliott. To say Homestead is the best track for Larson is an understatement. The No. 42 car has qualified 2nd and 3rd in the last two races in Miami, led 132 laps in 2016, 145 laps last year and has a 133.7 Driver Rating. No driver is even close in stats to Larson. He has also finished 3rd at Las Vegas, 3rd at Kansas and 5th at Texas in the playoffs. He has the best average finishing position at the 1.5-mile tracks in the playoffs. Larson is the best pick in the field this week. Chase Elliott is the second best choice for the Non-Playoff Drivers this week. Elliott has a 6.2 average running position on the 1.5-mile tracks in the playoffs and he won the race at Kansas last month. Elliott finished 5th at Homestead last year and he should add another top-five finish to his resume Sunday. This may be the last season we see Elliott listed as a Non-Playoff Driver at Homestead. The kid is that good. I really do not want Kyle Busch to win because I do not want to hear him talk about how great he is (although it is true). Busch has only led one lap on the 1.5-mile tracks in the playoffs. He may only lead one lap Sunday. I bet it will be the last lap if he gets to the front. This is my first season playing the Fantrax Bronze Point Salary Cap Game. I learned that I should not burn my trades so early in the season. I wish I had a trade left to get Joey Logano on my team this week. I would use it to replace A.J. Allmendinger. This game has had me pulling my hair out. I have been running in 2nd place in my league since the Coke Zero 400 at Daytona. I finally moved into first place in the race at Phoenix. With only 13 laps left I had a 12 point lead over my competition. Kurt Busch accidently took out Chase Elliott and he took out my lead too. I enter the last race of the season down by 1 point. I did not join this game to finish second and I do not expect you to finish second either. We need the perfect lineup to score as many points as possible Sunday. I will be giving this game extra attention this week.